The Soviet concentrate on preserving their remaining mechanized force and holding the panzers back as best they can to buy time to reinforce and fortify the Moscow defence line. Which sporadically runs south to Kharkov and then to Poltava and the coast. Finland: Fresh infantry divisions take up the position of the 10 Mech at Vipurii. The corps transits across the Soviet defensive line and crashes into the Fins holding the flank of their Eastward drive cadreing a 5-6 infantry division. Leningrad: Patrols notice a thickening of the German line and advances into north Estonia but take no action other than strengthen the line. More troops are rushed to the Valdai to block any German advance from that direction. Survivors from the line at Veliki Luki pull back into the swamps. Smolensk. The strong tank/mech force forgoes the temptation of counter attack for fear of being pinned and surrounded. The lessons of Kiev have been learned. Infantry occupy swaps and forests and strong tank/mech stacks bar the open spaces between. The supply line to Vitebsk is re-opened. Bialystok Pocket: Starvation eliminates 3 mech/Lt tk cadres. Kiev; Forces contract into the city and adjacent forts and await the inevitable assault. A maximum effort airlift gets 8REs of supplies into the city. Kiev is declared a Hero city as NKVD political troops rally the defence. 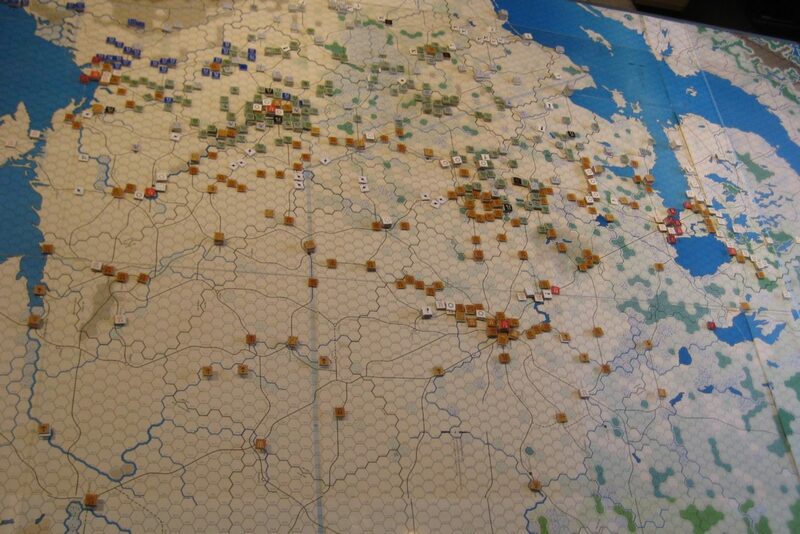 Rumanian Border: A propaganda victory is achieved when a surrounded two division stack attacks U2 a lone Luftwaffe flak unit which had strayed too close and eliminates it. Odessa; Two divisions seek to escape the German surrounding action while the rest fall back to the city and forts to defend the cordon. Ships from Sevastopol ferry supplies to the garrison. Losses Soviet Isolated 9, Finnish 3, German 2.